I finished and it worked out fairly well. who am I kidding? I’m over the moon with it. I sewed the signatures to the spine – I won’t know until I actually use it how effective and sturdy that will be! 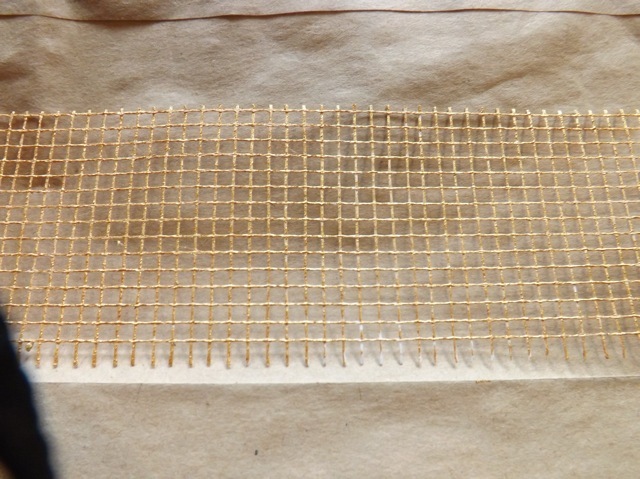 I did one signature with a small stitch and one with a bit longer one – I worry that the small stitch will be too weak and in future I think I might use the clear nylon thread or thicker linen thread. What can I do but use it and see what happens? There is very little gap between the signatures – I marked and clamped it all carefully to try to keep it all straight. I added a strip of the bags left over when I trimmed them to size, over the bare bit, both to reinforce it and to cover the gap. 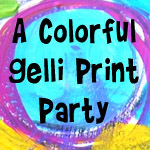 I pressed some drywall tape into gold paint on the Gelli plate. 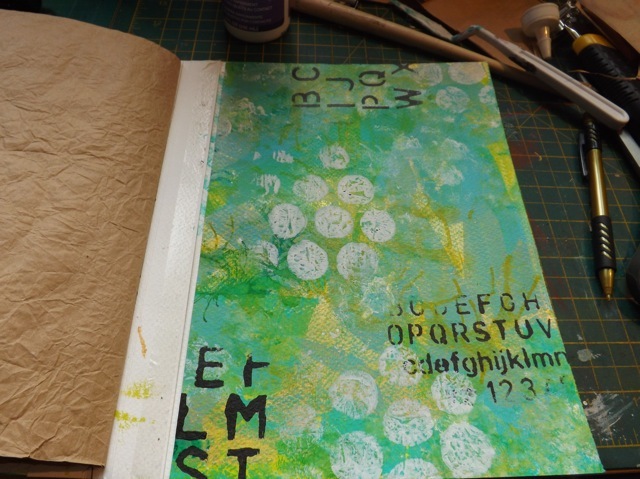 I often use my smaller Gelli plate as a sort of stamp pad, for lack of a better word. 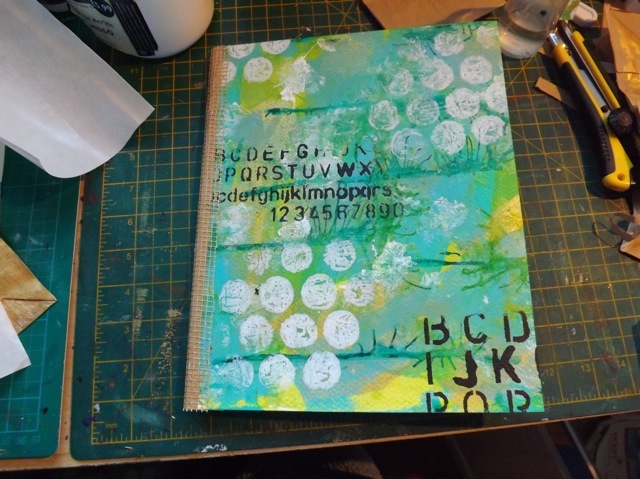 I find the giving nature of the surface and the fact the paint does stay damp for a bit, works really well to press in a stamp, get good cover on it, and then stamp. So I thought this would work with the drywall tape. It did, but to be honest I’m not sure just brayering the paint on wouldn’t have worked equally as well. I Covered the spine with a bit of the brown bag then layered the gold drywall tape over that. 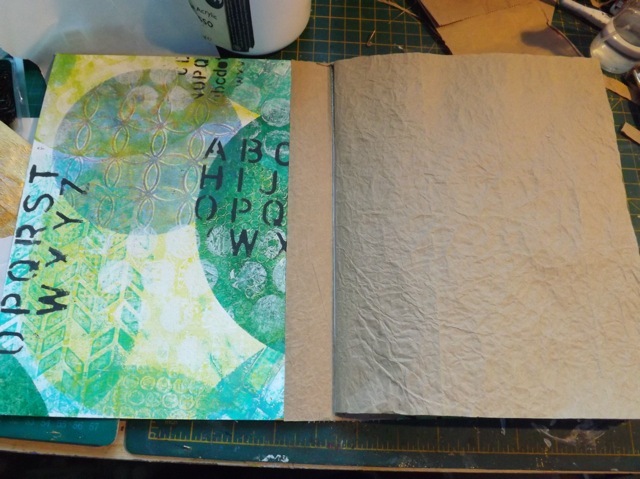 The adhesive on it is not that strong, so I may end up adding a layer of acrylic medium over it – in fact I may end up doing the whole cover, just to make it waterproof too. I one sense I am dying to get some paint into it, but in another I am scared stiff to mess it up. I just gotta let go, I think, and have at it! Categories: art, art journal, handmade books | Tags: art journal, art techniques, handmade books | Permalink. love your experimental nature – and your results too – play with this bone and have fun – heck you can always makes another. It looks great. Now you can try techniques and experiment with joy and abandon. No fear! Hey, it looks great! I’m thinking I need to make one. 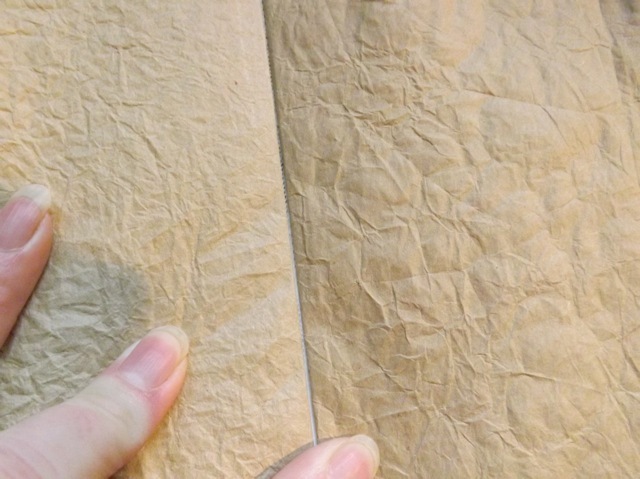 I have a whole bunch of craft paper that came in different things that were shipped to me. 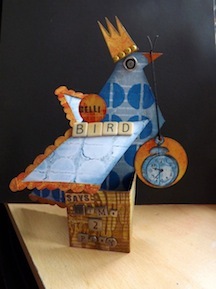 I just couldn’t throw it away, so I cut it (aproximate) 8.5 x 11 pieces. Those should work beautifully for the signatures. 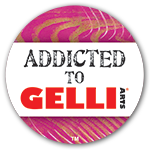 I just found your blog yesterday when I was searching for gelli plate ideas. I love it! 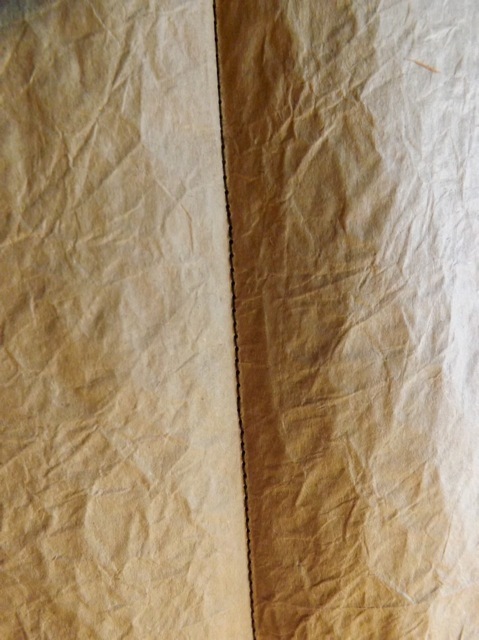 Love Love Love this “sack” book….mahalo for inspiring me! I’m not clear o n how you did the sewing – did you use a sewing machine? and yes, you just have to dive in and pretend you don’t care. If you’re too nervous, start on the 3rd page to take the terror off! LOL!